Kevin Smith Transportation Group is a Luxury Transportation company that services the entire Greater Philadelphia, PA area. KSTG delivers services daily in Bucks, Chester, Delaware, Doylestown and Philadelphia counties. This includes more than 300 cities, towns, boroughs and Providences across the area. One of the places a KSTG vehicle will regularly service is West Bradford Township, PA.
Kevin Smith Transportation Group delivers both Leisure and Corporate Transportation services in West Bradford Township, PA. KSTG’s Leisure division will often be seen sending out a Wedding Limo or Wedding Shuttle on most weekends. Service requests for a Limo or Party Bus for a Night on the Town or a trip to Philadelphia, PA for a concert or show is very common and popular for those who live in West Bradford Township, PA. The exciting requests for a Party Bus to the Manhattan Cruise Terminal or a night out at the casinos makes for a great night. If you are fortunate enough to work for one of the amazing companies in West Bradford Township, PA, then you may require the services of Kevin Smith Transportation Group and our Corporate Transportation division. Airport Transportation is a common service request with Philadelphia International Airport (PHL) located so close to West Bradford Township, PA. However, with nearly a dozen International Airports in the Mid-Atlantic area, many companies will utilize KSTG’s services for Airport Transportation to Newark International (EWR), Kennedy Airport (JFK) or other points north or south of the Philadelphia, PA area. Other Corporate Transportation services that Kevin Smith Transportation Group offers companies in West Bradford Township, PA include Shuttle Services. This may be needed for moving employees to local SEPTA stations for both their morning commute and returning home in the evening. KSTH Sprinters and Mini Buses are popular vehicles for this service. Some companies, with offices or clients around the country, often have employees traveling through local FBO’s. When Private Aviation is utilized, KSTG Cadillac XTS’s and Black Yukon’s are often seen transferring employees from their offices in West Bradford Township, PA to those local FBO’s including Northeast Philadelphia Airport, Doylestown Airport and Wings Field. Many companies in West Bradford Township, PA have been pushed by their Senior Management or Counsel’s office to follow strict Duty of Care requirements with their employees. This means that the days of using an unregulated Black Car Service for Corporate Transportation services is no longer allowed. For Kevin Smith Transportation Group, this means that our Black Car Service division, including our fleet of Cadillac XTS’s, Black Yukons and Black Infiniti’s, are regular visitors to West Bradford Township, PA.
West Bradford Township, PA is a township in Chester County, PA. The population is estimated at 12,376. There are three federal historic districts (Marshallton, Trimbleville, and Northbrook) on the National Register of Historic Places located within West Bradford Township. Also listed are the Baily Farm, Bradford Friends Meetinghouse, Como Farm, Derbydown Homestead, Humphry Marshall House, Marshallton Inn, and Temple-Webster-Stoner House. Baily Farm is a historic home and barn located in West Bradford Township, Chester County, Pennsylvania. The house was built about 1795, and is a two-story, five bay, stuccoed stone dwelling in a vernacular Federal style. It has a gable roof with gable end chimneys. Also on the property is a frame bank barn on a stone foundation. It is believed to date to the 18th century. Bradford Friends Meetinghouse, also known as Marshallton Meeting House, is a historic Quaker meeting house located at Marshallton in West Bradford Township, Chester County, Pennsylvania. It was built in 1764-1765, and is a one-story, stone structure with a gable roof. A porch was added to two sides of the building in the 19th century. The interior is divided into four rooms, rather than the customary two. Abraham Marshall, father of botanist Humphry Marshall was instrumental in the establishment of the meeting in the 1720s. The meeting originally met from 1722 to 1727 at the Marshall home, Derbydown Homestead, from 1722 to 1727. The Humphry Marshall House, also historically known as Marshall’s Garden, Marshall’s Arboretum, and the Botany Farm, is a historic property in Marshallton, an unincorporated village in West Bradford Township, Chester County, Pennsylvania. Built in 1773-74, the house is a good example of an 18th-century Pennsylvania country house, which is most notable as the home of early American botanist Humphry Marshall (1722-1801). The property was also where Marshall established one of the first botanical gardens in what is now the United States. The house was documented by the Historic American Buildings Survey (HABS) in July 1958. It was listed on the National Register of Historic Places on May 27, 1971 and was designated a National Historic Landmark on December 23, 1987. The property is now privately owned; the gardens have declined since Marshall’s time, but its basic layout has survived. Temple-Webster-Stoner House, also known as the Little House on Broad Run and Old Mill House, is a historic home located in West Bradford Township, Chester County, Pennsylvania. A datestone suggests the house was built in 1714 but may have been built at the time of the mill about 1730. It is a 2 1/2-story, fieldstone structure. A kitchen wing was added about 1800. Now, it is used as a Unitarian Retreat. The entire team at Kevin Smith Transportation Group is proud of our partnership with every company, venue and person from West Bradford Township, PA who chooses KSTG as their #1 Transportation Company. We believe our priorities around luxury helps us deliver our services for everything from a once in a lifetime Wedding celebration to supporting our Corporate clients who require use of our Shuttles and Sprinters for a company event. 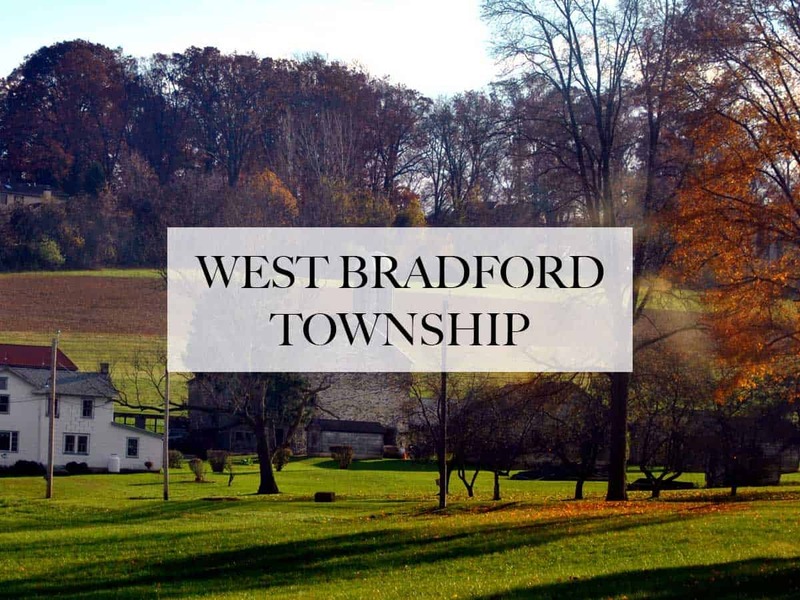 With West Bradford Township, PA and KSTG working together, we are confident KSTG vehicles will continue to support the entire area for years to come.